Earlier in the week, I spoke to an institutional portfolio manager running a quantitative process who was having some difficulty with his performance. The markets have been volatile and stocks have been hit by cross-currents, not only by macro related events, but also by stock specific news this Earnings Season. My advice to him consisted of, in essence, to remain calm and stay with your investment discipline. Academics Van Gelderen and Huij recently wrote a paper entitled Academic knowledge dissemination in the mutual fund industry: Can mutual funds successfully adopt factor investing strategies? In this study, we investigate if investors that have adopted investment strategies based on asset pricing anomalies documented in the academic literature (i.e., the low-beta, small cap, value, momentum, short-term reversal, and long-term reversal factors) consistently earn positive abnormal returns. For this purpose we evaluate the performance of a large sample of U.S. equity mutual funds over the period 1990 to 2010. We find evidence supporting the value added of investors adopting factor investing strategies: low-beta, small cap, and value funds earn significant excess returns. We also find that these excess returns are sustainable and have not disappeared after the public dissemination of the anomalies when more asset managers have started to adopt factor investing strategies. We propose some criteria that might be helpful to determine the successful application of academic insights in the context of investment strategies. Our findings have significant implications for the role of academic research and knowledge management in the investment management industry. There is another reason to believe that these strategies offer the prospect of future return premia for patient, long-term investors. These premia are very volatile and can disappear or go negative for many years. The chart on the following page highlights the percentage of 36-month rolling periods where the factor-based portfolios – high quality, momentum, small cap, small cap value and value – underperformed the broad market. To many investors, three years of under-performance is almost an eternity. Yet, these factor portfolios underperformed the broad market anywhere from almost 15% to over 50% of the 36-month periods from 1982 to 2012. If one were to include the higher transaction costs of the factor-based portfolios due to their higher turnover, the incidence of underperformance would be more frequent. One of the reasons that these premia will likely persist is that many investors are simply not patient enough to stay invested to earn them. [W]hether you choose to try to harvest returns from relative strength or from one of the other factors, patience is an underrated component of actually receiving those returns. The market can be a discouraging place, but in order to reap good factor performance you have to stay with it during the inevitable periods of factor failure. Don't panic and stick with your discipline. Bad performance is no fun at all, but if you are convinced that you can produce alpha over an appropriate time horizon, stick with your investment discipline. I have seen some buzz and excitement among technical analysts and in the blogosphere about a rebound in the commodity sectors of the stock market. While these sectors were highly oversold and a bounce was not unexpected, my analysis suggest that the sustainability of a rebound is unlikely. The more likely scenario is a sideways consolidation to digest the gains from the tactical rally. Here are the gold stocks against the market. I'm not sure why people are getting so excited here. Sure, the short-term relative downtrend has been broken, but the longer term relative downtrend remains intact. Here is the relative chart of the energy sector. It bears some semblance to the metals - rally out of a relative downtrend and exhibiting a consolidation pattern. The same thing goes for the metals. Well, you get the idea. Tactically, I also like to watch the high-beta small cap resource stocks relative to their large cap brethren to measure the "animal spirits" of the market to give me clues as to the sustainability of this rebound. Here are the junior golds (GDXJ) relative to the senior olgds (GDX). Unless the juniors can show more strength to break the relative downtrend, it suggests to me that this rally is likely to be brief and fleeting. 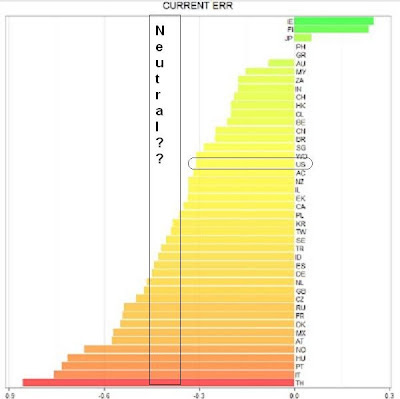 Up here in the Great White North, I monitor the relative return of the junior TSX Venture, which is weighted towards the speculative junior resource names, to the more senior and more broadly diversified TSX Index. Nope. 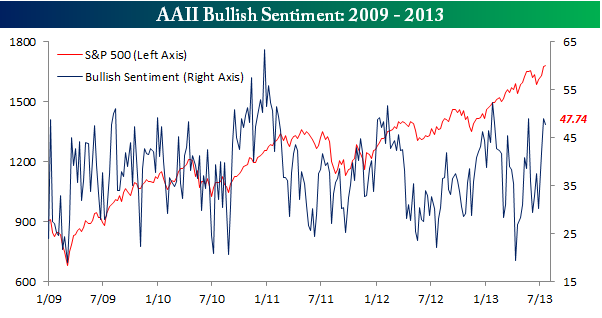 No rebound in animal spirits here either. It was pointed out that we are experiencing bullish divergences on the 14-week RSI and in the past three occasions, the HUI/SPX ratio has rallied strongly in favor of HUI. Moreover, the ratio is sitting at a major relative support level and, given the highly oversold conditions and the bullish RSI divergences, conditions are highly suggestive of a strong rally for the golds. While I would not rule out a tactical rally in gold and gold stocks, I question the sustainability of any bullish thrust. 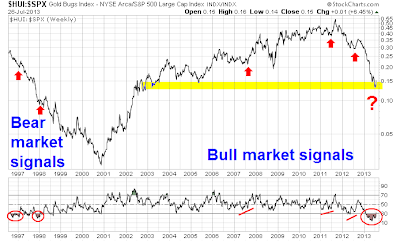 I would point out that the highlighted bullish RSI divergences occurred in a secular bull market for gold and other commodities. 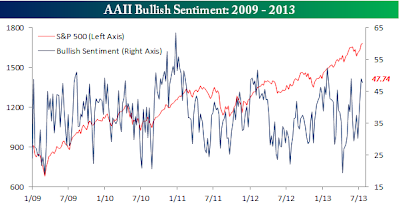 It is questionable whether gold remains in a secular bull today. Consider the occasions on the left had side of the chart, where oversold RSI conditions occurred in the HUI/SPX ratio in a bear market. On those occasions, the rebound was only a blip and the downtrend continued soon afterwards. 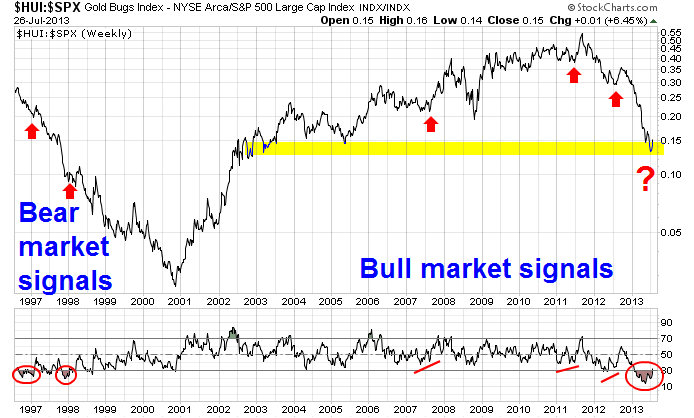 The key issue to the analysis that underlies the above chart is the question of whether gold is in a bull or bear market. Choose your interpretation and your own conclusion. It's not just technical headwinds that the commodity sectors face, the macro fundamental backdrop does not scream sustainable rebound for these late cycle sectors. Walter Kurtz of Sober Look highlighted this chart from Credit Suisse showing the relative performance of cyclical vs. defensive sectors by region. The US and eurozone ratios are fairly flat, while Japan shows a minor uptick and China, which is the major marginal buyer of commodities, is going south. Can the commodity sectors rebound strongly in the absence of Chinese demand and a so-so performance from the major developed markets? China ordered more than 1,400 companies in 19 industries to cut excess production capacity this year, part of efforts to shift toward slower, more-sustainable economic growth. Steel, ferroalloys, electrolytic aluminum, copper smelting, cement and paper are among areas affected, the Ministry of Industry and Information Technology said in a statement yesterday, in which it announced the first-batch target of this year to cut overcapacity. Excess capacity must be idled by September and eliminated by year-end, the ministry said, identifying the production lines to be shut within factories. China’s extra production has helped drive down industrial-goods prices and put companies’ profits at risk, while a survey this week showed manufacturing weakening further in July. Premier Li Keqiang has pledged to curb overcapacity as part of efforts to restructure the economy as growth this year is poised for the weakest pace since 1990. Does this sound like a government that is panicked about growth falling below 7% and is anxious to stimulate at all costs? Do these measures sound like they are supportive of a short-term spike in commodity demand? In short, the rebound in gold and other commodity prices appear to be temporary and the bear trend will likely re-assert itself after a short rebound. This does not look like the start of an intermediate term uptrend. For commodity bulls, the current environment is like the unfortunate case of being locked up by the secret police and having your interrogator go home for the evening. You may think that the torture is over, but the beatings will continue when he returns in the morning. I was reviewing some charts after the close and I came upon this chart. Notwithstanding Thursday's action, which was the result of earnings misses by two homebuilders, what does this chart of the homebuilders ETF (XHB) against the market telling us about market expectations about the housing rebound? On a a relative basis, XHB staged a relative rally from the Eurogeddon lows of 2011, started rolling over in early 2013 and now has violated a relative support level. 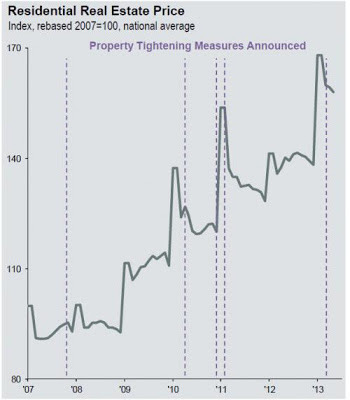 Now consider this recent post from Barry Ritholz about private equity seems to have gone overboard on the “rent to flip” in US housing. Mr. Market starting to get nervous about housing, especially if mortgage rates rise any further. Take a look at today's chart and you will see the concerning behavior we are talking about. 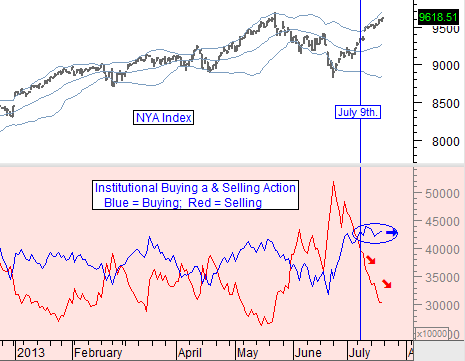 First, note the Institutional Buying was a little higher on Friday, but it has essentially moved sideways since July 9th. Unlike the market in its buying binge, the Institutions have been merely "holding their own" relative to any new buying. Now take a look what the Institutional Selling looks like. It didn't move sideways, it moved DOWN significantly. This means that they sold less and less as the market went up. That behavior "allowed" the market to go up on its own without any significant selling actions that would pull it down. From a behavioral standpoint, allowing the market to rise higher would benefit you if you wanted to sell at a greater profit later. My point here is that the the Institutional Investors have not been participating in the current move, but have been acting as "enablers", allowing the market to move higher while not exhibiting actions that support it. Under these circumstances, I can't get wildly bullish about stocks here. These readings suggest that, at a minimum, stock prices are likely to pause consolidate sideways, if not correct downwards. Over at Macroeconomic, the headline looks dire. Though the methodology is a little misleading, the conclusion is correct: Weakening global earnings momentum - Rcube Global Macro Research. 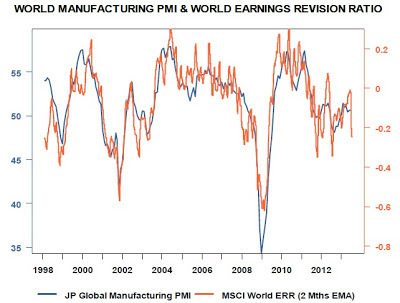 Global earnings momentum is weakening. Earnings revision ratios are moving lower almost everywhere except Japan. Can the US hold up the world? Regular readers know that I tend to look at the markets from a global framework. These developments leave my inner investor worried. Right now, the American economy is still showing signs of tepid, though no gangbuster, growth. If the rest of the world is slowing, can the US de-couple or hold up the global economy? My inner trader tells me not to worry. These kinds of things don't matter until they matter. For now, we continue to see positive breadth powering the major averages to new highs, the Dow Jones Transports making new highs, which confirm the Dow Jones Industrials' advance and continued leadership by the Consumer Discretionary sector indicating that the American consumer is still healthy. So, don't worry, be happy! My inner investor is far more concerned as these longer term indicators suggest that US equities may be nearing an inflection point. The risk-reward picture is turning negative and he doesn't want to stick around at the party until the very end when the cops raid the place. He reminds my inner trader of that old Wall Street adage, "Bulls make money, bears make money, but hogs get slaughtered." What's more, the solutions have turned away from the popular perception of "all austerity, all the time" to a greater focus on growth. The recent Berlin summit that Angela Merkel held on youth unemployment is just one signal that the Eurozone leadership is now focusing on greater stimulus measures. Britain a better way to play Europe? There may be a way to get exposure to the Eurozone economies without the drama - Britain. The UK is a relatively large and diversified economy that is part of the EU and trades principally with its partners on the Continent. However, it does have the advantage of being able to adjust competitive differences through the exchange rate mechanism instead of being locked into a single currency like the euro. More recently, the outlook for the British economy is looking up. The UK June PMI beat expectations as the British economy posted its fastest growth in two years. Business confidence is surging and hit levels last seen in January 2008. Take a look at this ten year chart of the relative returns of UK stocks (EWU) against Eurozone equities (FEZ). Both are ETFs trading in USD so that any currency effects are already factored in. UK equities had been in a trading range against its Eurozone counterparts until the adjustments after Lehman Crisis and the EWU/FEZ ratio has been in a relative uptrend ever since. As the ratio has retreated to test the relative uptrend line, it may be a good entry point for this trade. Indeed, the UK market may be a better way to gain exposure to Europe, but without the drama. It is also a cautionary tale for the gold standard cheerleaders who believe in a rigid exchange rate regime (like the euro) compared to the flexibility of floating exchange rates, but that's a post for another day. When I first joined Merrill Lynch, I sat next to a young analyst named Savita Subramanian who was working for Rich Bernstein in strategy research. Though we worked in different groups, I can recall sharing with her everything from Factset data tricks to suggestions about her (then) boyfriend. I have the utmost respect for her as a person and as an analyst. As such, we have lowered our normalized risk premium assumption in our fair value model for the end of 2013 from 600bp to 475bp, which assumes roughly another 25bp of ERP contraction by year-end. We have also raised our normalized real risk-free rate assumption for year-end from 1.0% to 1.5%. Not only have current and future inflation expectations declined since last fall, but long-term interest rates have also begun to rise recently. Meanwhile, our Rates Strategist Priya Misra also recently raised her interest rate forecasts. Sorry, Savita. I respectfully disagree. The first part of the chart from 1987 to 2009 represents an economic growth phase powered by rising credit growth and rising financial leverage. The latter part, post-Lehman Crisis, is the deleveraging phase of the long cycle. Just read Ray Dalio's explanation of the credit cycle using the Monopoly game analogy and you'll get the idea. 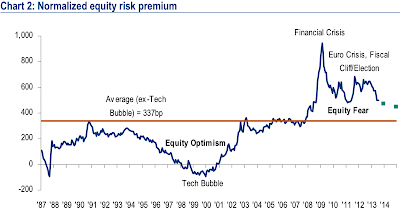 If you accept the premise that the two phases of the cycle are different, then you can't apply the norms of an equity risk premium from one phase to another. Now consider what the Fed did in the wake of the Lehman Crisis (see my previous posts It's the risk premium, stupid! and Regime shifts = Volatility). The Federal Reserve intervened with a series of quantitative easing programs, designed to lower interest rates and lower risk premiums. An artificially lower risk premium forces the market to take more risk, reach for yield, invest, etc. It was thought that such actions would kick start a virtuous cycle of more growth, employment and therefore recovery. Fast forward to May 22, 2013. The Fed signals that it is thinking of tapering off its QE program. The longer term effect of tapering, regardless of its timing, is to allow risk premiums to find their own natural levels. Since they have been artificially depressed by QE, do you think that they would fall further as postulated by BoAML's analysis? I recognize that the ERP shot up in the wake of the Lehman Crisis and the various versions of eurozone sovereign debt crisis in the last few years. 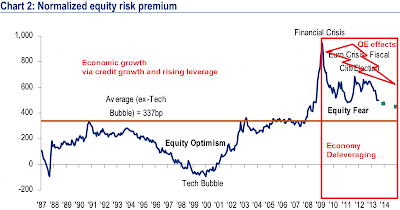 As fear levels have faded, so should the equity risk premium. Nevertheless, to believe that the ERP will return to pre-crisis levels is to disregard the longer term nature of the deleveraging cycle and the net effects of the Fed's QE programs which depressed risk premiums globally. Having reflecting on the global situation, it seems to me that there are two or perhaps three regime shifts occurring. Markets don't handle single regimes shifts well and there will be volatility, but multiple regime shifts is going to mean uber-volatility. My inner trader wants to dial down the risk in his portfolio as the moves could be treacherous. We will see rip-your-face-off rallies (for anyone caught short) and bayonet-the-wounded downdrafts (for anyone with long positions). Let me explain by going through the Big Three global regions one at a time: the US, Europe and China. In the US, the Fed indicated on May 22 that it is considering a plan to taper off its QE purchases. In other words, it may be taking its foot off the accelerator but it is not about to stomp on the brakes (raise rates). Some market participants such as banks and hedge funds appear to have gotten the risk premium message. In the wake of the May 22 tapering comments, we have seen the start of a positional risk-off trade, which is less bearish globally than the macro risk-off trade. Positional risk-off means that traders are unwinding the hedged carry trades of borrowing short and lending low, or borrowing cheaply and lending to lower credits. Longer term, it will affect risk premiums worldwide, but remember that this is a regime shift and not all market participants in a regime shift move at the same time because not everyone gets the message at the same time. Moreover, even though the Fed's tapering process is slow and linear, the market reaction may not be - and that's a characteristic of regime shifts. I recognize that US equities have become the global leadership, but for any investor with a time horizon more than a few weeks, consider US valuations. Simply up, US CAPE does not stack up well against the rest of the world. The Governing Council sharpened its communication by announcing that it expects the key ECB interest rates to remain at present or lower levels for an extended period of time. This expectation was based on the overall subdued outlook for inflation extending into the medium term, given the broad-based weakness in the real economy and subdued monetary dynamics. Wow! What happened to the previous policy that the ECB never "pre-commits" to any course of action? Carney's statement was somewhat milder, as the BoE stated that it would move toward forward guidance at its August meeting. In effect, the ECB and BoE effectively told the market: "The Fed has been throwing a giant party and they told you that "last call" would be some time late this year. If you are worried, come over here. The party is going to continue over at our place!" These statements represent another form of regime shift. Europe is trying to de-couple from US monetary policy and these kinds of policy divergences will mean important shifts in capital flows that will affect the currency markets and the cost of capital for companies operating in the US and Europe. Watch for that adjustment process to play out over the next few months. Meanwhile, China's new leadership seems intent on cooling down an overheated economy and re-balancing the source of economic growth from an infrastructure and export oriented source to consumer led source. It has signaled that it is not afraid of slower short-term growth in order to achieve its objectives. It quickly became apparent that these products were very popular with the banks’ clients and it was easy to see why. They paid yields above 7 per cent, far more than the meagre amount offered on deposits. Less apparent was what these clients were actually investing in, or under what terms. Some involved loaning money to buy land for property developments, despite banks not being allowed to lend money for land acquisition. Others involved investing in the pet projects of local governments, such as building roads in remote border areas or the debt of water pipelines. In many cases, the loans being offered to potential investors had virtually no conditions to protect the lenders, while the collateral – if there was any – often consisted of unnamed items or personal guarantees. As Michael Pettis said near the end of June, “the PBoC has almost no experience of any kind of financial market condition except that of soaring money creation and credit expansion. Until last year they have never had to deal with a stable or even contracting money supply, and consequently they have had little experience in dealing with these kinds of conditions.” Simply the fact that the PBOC is looking at this market is enough to warrant caution. Chinese Finance Minister Lou Jiwei signaled the world’s second-biggest economy may expand less than the government’s target this year and that growth as low as 6.5 percent may be tolerable in the future. While the government in March set a 2013 growth goal of 7.5 percent, Lou said he’s confident 7 percent can be achieved this year. He spoke yesterday at the U.S.-China Strategic and Economic Dialogue in Washington. The nation’s broadest measure of credit fell to a 14-month low in June during an interbank cash squeeze, central bank data showed today. Lou ruled out the possibility of widening the budget deficit to stimulate the economy. Instead, policy makers have decided to cut the spending of central government agencies by 5 percent, and may use the savings to reduce taxes or increase spending on measures to support jobs and growth, he said. The new leadership's focus on these structural adjustments represent a major regime shift from the previous leadership's policy of stimulating with more credit driven growth whenever the economy slowed and damned the consequences. Given the PBoC's lack of experience with slower growth, the risk of a policy accident is high. How do you write volatility in Chinese? In conclusion, we are in the vortex of several storms and volatility will be high. Expect that the markets will oscillate between euphoria and despair in the space of a few days. My inner investor, who has a long-term plan, is going to relax, go on holiday and ignore the volatility. My inner trader is lightening up positions and keeping his powder dry. He is hoping to fade the rallies and accumulate the sell-offs in order to clip a few pennies here and there. Snowden Affair fallout: RIMM experience as blueprint for US Tech? I have learned over the years to be politically agnostic when I put on my investor's and trader's hat, because political biases can color judgement and lead to negative investment results. While I have my own personal opinions about the Snowden Affair, I have kept them to myself in this blog. It is when Edward Snowden's revelations about the NSA's actions have an impact on the markets that I have to speak up. Oh, this is getting to be fun! The lead story at the Financial Times tonight is about how the European Union is threatening to suspend two data sharing agreements with the US. The pink paper also adds that this row has the potential to undermine the EU-US trade negotiations which are set to start next week (we speculated a few days ago that this might come to pass). On our side of the pond, so far only the Wall Street Journal has weighted in, with a cheery headline U.S.-EU Trade Talks on Track Despite Spy Fears which is narrowly accurate since the trade negotiations have not been rescheduled but seems to understate the degree of unhappiness and ire. The interesting question is how and why has this row escalated now? Mind you, the Eurocrats do have a lot to be angry about. Remember, the US was caught spying on EU officials. Der Speigel released information from Edward Snowden that charged that the NSA had bugged the European Union’s offices in Washington and the UN and hacked into their computers (which enabled them to monitor meetings) and targeted other missions. The United States has agreed to share information with the European Union about its huge Internet and phone surveillance programme, a senior EU official said today. EU Home Affairs Commissioner Cecilia Malmstrom and Justice Commissioner Viviane Reding secured the agreement from US Attorney General Eric Holder after talks with the American official in Dublin, Malmstrom said. The EU and US officials were meeting as part of already scheduled ministerial talks in the Irish capital. The move comes days after the EU demanded answers from Holder and warned of a “grave” threat to the rights of European citizens from the intelligence programme. As I am reading between the lines of the two FT stories tonight, US agrees to talks with EU on surveillance, and Brussels threatens to suspend data sharing with US in spying row, the Administration may be even more on the back foot that it appears. (I welcome input from readers of the European press, particularly those who have a good handle for how the EU deals with the governments of member states over jurisdictional issues). Google’s wearable computing project Glass raises significant privacy and data protection concerns, according to an international group of 36 authorities, who have signed a joint letter to Google chief executive officer Larry Page. At issue are the “obvious, and perhaps less obvious, privacy implications of a device that can be worn by an individual and used to film and record audio of other people” – for example, fears of ubiquitous surveillance, and how data collected from the device is stored, shared and used. •How does Google Glass comply with data protection laws? •What are the privacy safeguards Google and application developers are putting in place? •What information does Google collect via Glass and what information is shared with third parties, including application developers? •How does Google intend to use this information? •While we understand that Google has decided not to include facial recognition in Glass, how does Google intend to address the specific issues around facial recognition in the future? •Is Google doing anything about the broader social and ethical issues raised by such a product, for example, the surreptitious collection of information about other individuals? •Has Google undertaken any privacy risk assessment the outcomes of which it would be willing to share? •Would Google be willing to demonstrate the device to our offices and allow any interested data protection authorities to test it? If you were the privacy commissioner or regulator in the EU or any non-US country (e.g. Europe, Singapore, China, etc. ), how would you feel about allowing Google Glass into your jurisdiction, knowing that any data that Google retains may wind up in an NSA archive somewhere? Or knowing that Apple cooperates with the US intelligence services, how would you feel about allowing Apple products such as the new iWatch into your country? Do you want to formulate a policy regarding those Android enabled devices? How about allowing your local telecom services provider to enter into a joint venture with a US teleco? And the Brazilian security services could access all this in real-time and archived it somewhere in Brazil in perpetuity. Would you be more or less likely to fly in an Embraer jet or to purchase one? You're not a terrorist. You're not doing anything wrong. Why should you care about your actions being watched by the Brazilian government? The Snowden revelations about NSA activities, at the margin, damage the competitiveness of American technology companies - and that's what concerns me. For illustrative purposes, I can remember seeing the story that (then) Research in Motion capitulating to India's demands and handing the country access to its Blackberry network. For me, that was the beginning of the end of the company's competitive position. The same can happen to American technology companies. China’s money-market cash squeeze is likely to reduce credit growth this year by 750 billion yuan ($122 billion), an amount equivalent to the size of Vietnam’s economy, according to a Bloomberg News survey. [O]ne question that Bloomberg did not answer is just why is China engaging in the kind of counter-monetarist activity, that would result in an epic market collapse were it to take place in the US, Europe, the UK, Japan, or any other "developed" country whose growth now relies exclusively on central bank generosity. Presenting Exhibit A: China's residential real estate prices, via JPM. So there you have it: no matter what China has attempted, no matter how much it has punished the Shanghai Composite, it has been completely unable to offset the endogenous and/or exogenous (Fed, ECB, BOJ hot money) credit from sending the Chinese housing bubble into absolutely stratospheric levels. It is this bubble that the PBOC is doing all it can to deflate gradually and controllably, lest it pops in the biggest out of control bubble burst in developing market history. 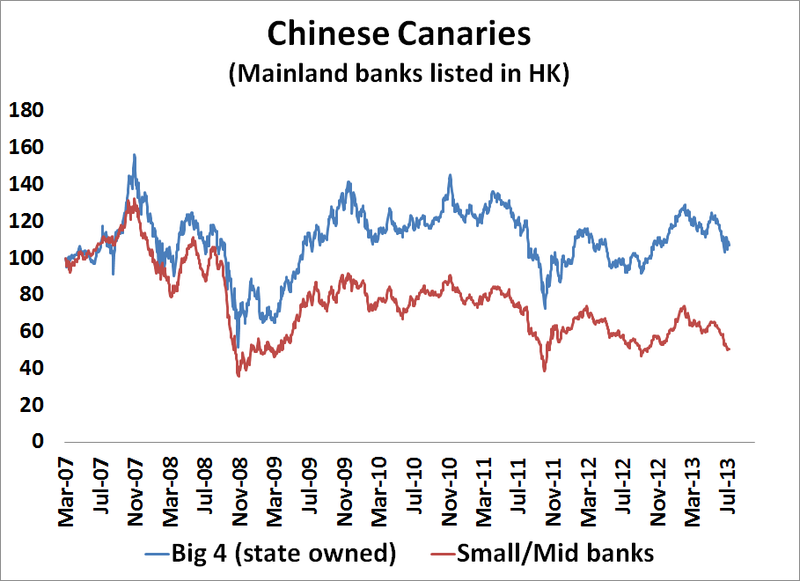 As the chart shows, the smaller and mid-sized banks have underperformed the larger state-owned banks for the last five years. 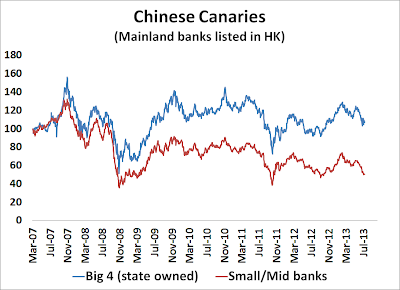 Both composites have been falling in light of China's liquidity squeeze and the small/mid sized banks. Both are depressed and approaching the levels last seen during the eurozone crisis of 2011 - but we are not there yet. Bottom line - Stress levels are elevated and these canaries are not behaving well and we should keep an eye on them, but it's not time to hit the panic button yet. Last week we wrote that Bernanke could not be happy with the way long bond rates reacted to his press conference answer that the Fed could begin lessening its rate of bond purchases in the next few months, and that he would attempt to sooth the market in yesterday’s press conference following the FOMC meeting. Well, he tried, but ended up making things worse, at least in the perception of the markets. Investors, however, took what Bernanke apparently thought was increased clarity to mean greater hawkishness, and, as a result, bond yields soared as stocks tanked. In addition the markets gave far greater importance to the potential reduction of bond purchases, whereas the Fed attached greater significance to the continuing expansion of their balance sheet. To the contrary, I believe that the Bernanke Fed knows exactly what it is doing with its communications policy. Remember what the intent of the various quantitative easing programs were designed to do. The intent of QE is to lower interest rates, lower the cost of capital and lower the risk premium. In the wake of the Lehman Crisis of 2008, the Fed stepped in with QE1. It followed with QE2 and QE3, otherwise known as QE-Infinity. The Fed first lowered short rates, told the market that it was holding short rates down for a very long, long time. It then followed up with purchases of Treasuries further out on the yield curve and later started to buy Agencies as well in order. The message from the Fed was: "We want you take take more risk." Greater risk taking meant that businesses would expand, buy more equipment, hire workers, etc. It hoped to spark a virtuous cycle of more sales, more consumer spending and to revive the moribund real estate market. 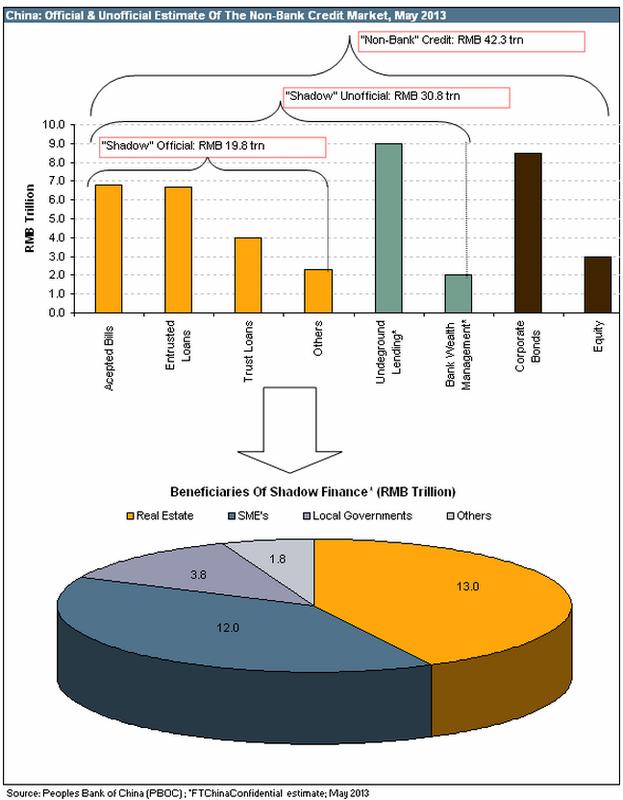 Moreover, banks could repair their balance sheets with the cheap capital. Imagine that you are a bank. The Fed tells you that it is lowering short rates and holding them low for a long time. That is, in essence, a signal to borrow short and lend long. In the summer of 2009, T-Bills were yielding roughly 0.5% and 10-year Treasuries were roughly 3.5%. If the bank were to borrow short and lend long with Treasury securities (no credit risk), it could get a spread of roughly 3%. Lever that trade up a "conservative" 10 times and you get a 30% return. 20 times leverages gets you 60% return. Pretty soon, you've made a ton of money to repair your balance sheet. The banks weren't the only ones playing this game. The hedge funds piled into this trade. Pretty soon, you saw the whole world reaching for yield. The game was to borrow short and lend either long or to lower credits. Carry trades of various flavors exploded. There were currency carry trades, some went into junk bonds, others started buying emerging market paper. You get the idea. The net effect was that not only interest rates fell, Risk premiums fell across the board. The equity risk premium compressed and the stock market soared. 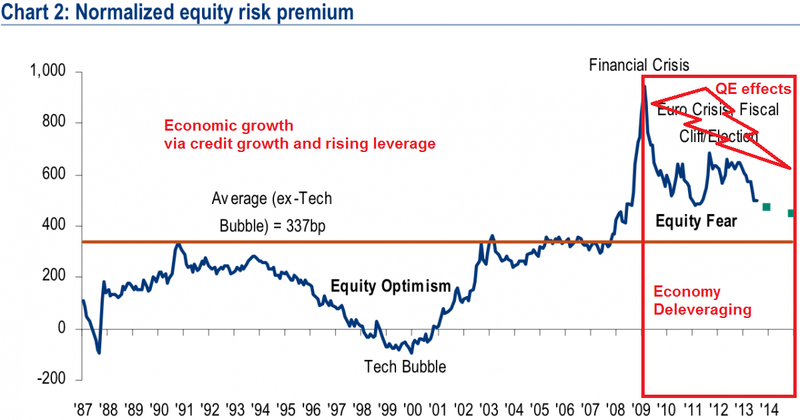 Credit risk premiums narrowed and the price of lower credit bonds boomed. During these successive rounds of quantitative easing, analysts started to wonder how the Fed manages to exit from its QE program and ZIRP. We all knew that the day would have to come sooner or later. So on May 22, 2013, Ben Bernanke stated publicly that the Fed was considering scaling back its QE purchases, but such a decision was data dependent. Our results provide some grounds for optimism about the likely efficacy of nonstandard policies. In particular, we confirm a potentially important role for central bank communications to try to shape public expectations of future policy actions. Like Gürkaynak, Sack, and Swanson (2004), we find that the Federal Reserve’s monetary policy decisions have two distinct effects on asset prices. These factors represent, respectively, (1) the unexpected change in the current setting of the federal funds rate, and (2) the change in market expectations about the trajectory of the funds rate over the next year that is not explained by the current policy action. In the United States, the second factor, in particular, appears strongly linked to Fed policy statements, probably reflecting the importance of communication by the central bank. If central bank “talk” affects policy expectations, then policymakers retain some leverage over long-term yields, even if the current policy rate is at or near zero. From my read of market commentaries, I believe that analysts are focusing too much on the timing and mechanics of "tapering" and not on the meta-message from the Fed. If quantitative easing is meant to lower interest rates and lower the risk premium, then a withdrawal of QE reverses that process. In effect, the Fed threw several giant parties. Now it is telling the guests, "If things go as we expect, Last Call will be some time late this year." Imagine that you are the bank in the earlier example which bought risk by borrowing short and lending long, or lending to lower credits in order to repair your balance sheet. When the Fed Chair tells you, "Last Call late this year", do you stick around for Last Call in order to make the last penny? No! The prudent course of action is to unwind your risk-on positions now. We are seeing the start of a new market regime as risk gets re-priced. I actually give Bernanke full credit for giving the markets a chance to start to price that in ahead of the event, and to re-introduce the notion to the investment class that markets are a two-way bet, not a straight line up. Volatility notwithstanding, I give Berananke an A+ for shaking off the market complacency that came to dominate the market thought process of the first four months of the year (to the point where the bubbleheads on bubblevision were counting consecutive Tuesdays for Dow rallies). Ben's communication skills may be better than you think - underestimating him may be as wise as underestimating Detective Columbo, who also seems "awkward" but was far from it. Bernanke knows exactly what he is doing when he hints about tapering in his public remarks. 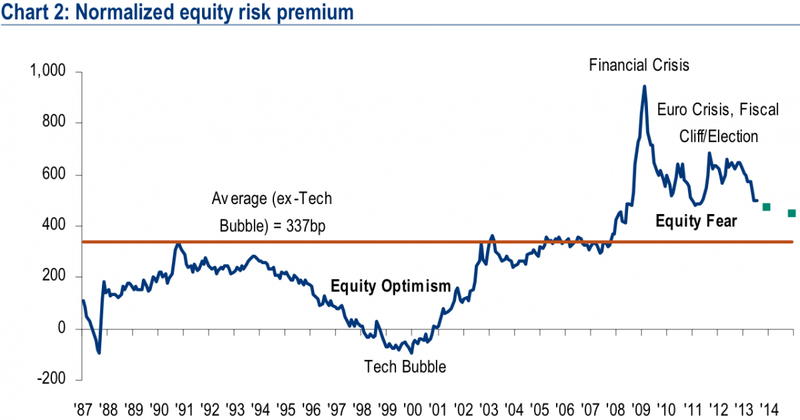 It's the risk premium, stupid! And it's going up. As the beginning of the second-quarter earnings season approaches, the negative guidance sentiment is weighing on analyst estimates. So far, S+P 500 companies have issued 97 negative earnings preannouncements and only 15 positive ones, for a negative to positive ratio of 6.5. The guidance has contributed to the downward slide in second quarter growth estimates, with EPS currently estimated to grow 3.0%, down from the 8.4% estimate at the beginning of the year. Analysts have an even bleaker outlook for the top line. After a first quarter when S+P 500 companies reported an aggregate revenue growth rate of 0.0%, the consensus currently calls for 1.8% growth in the second quarter. With revenue growth holding back earnings for the past several quarters, we did an evaluation of company management teams’ outlooks for their revenues. 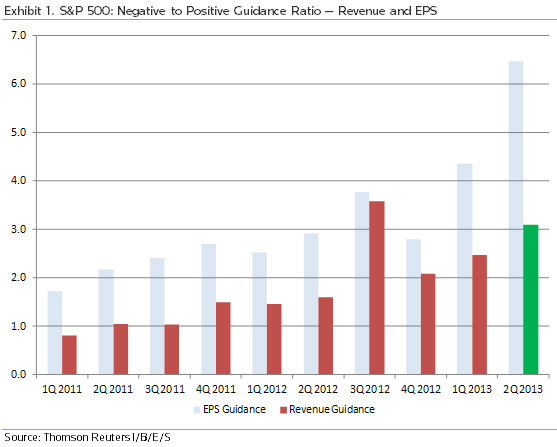 Over the time period evaluated, Q1 2008–present, revenue preannouncements were more balanced than were EPS preannouncements. On average, there were 1.7 negative revenue preannouncements for each positive one. This compares with an N/P ratio of 2.4 for EPS over the same period. The stock market is facing headwinds. This is a regime shift. Markets generally don't react well to regime shifts and inflection points like these. Expect volatility and an intensee focus on headlines. The path of least resistance for stock prices, notwithstanding a robust economic recovery, is down. * Ben Bernanke is expected to take questions after his speech. If anyone who is reading this happens to be there, please ask the following for me: "Mr. Chairman, it appears that the latest round of quantitative easing where the Fed bought Agencies instead of Treasuries was inteneded to narrow the risk premium between the two asset clases. Would it fair to conclude that when the Fed starts to wind down its QE program, risk premiums are expected to widen their natural market determined levels?"